There are definitely times when you find yourself doing something that you never could have dreamed you would ever do… last Monday was just such a day! 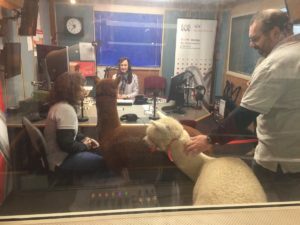 Following a call from ABC Central Victoria radio (in Bendigo, Victoria), we were asked to pop into the studio for a chat about alpaca trekking. 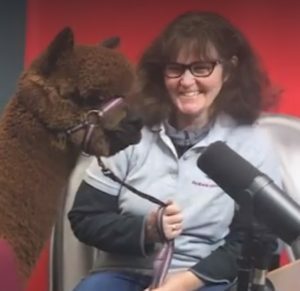 We thought that this would provide some fantastic exposure for our small business – but there was an unusual catch – we had to take our alpacas into the studio as part of the interview! Being interviewed on radio – something none of us ever thought we’d do! Now, alpacas aren’t generally the most talkative of creatures, but we decided that it sounded like fun! 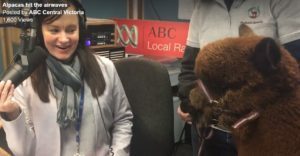 So, armed with two alpacas in the float, and with an array of emotions from fear to excitement, we headed off to Bendigo for a 9:30am ‘On-Air’ time. Wyatt just loved the idea of being a radio announcer! 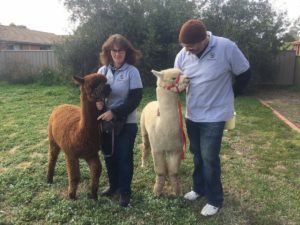 Anyone driving along Napier Street near Lake Weeroona Park in Bendigo may have spotted the unusual sight of us leading our two alpacas – Wyatt and Wellington – across the road into the studios – there were certainly lots of interested onlookers. On arrival at the station, the animals behaved beautifully: walking straight into the building and saying hello to everyone working there. With a few minutes to spare, we were then ushered out to the back of the studio (in what we called ‘the alpaca green room’) before heading in to make our collective radio debuts. Waiting in the ‘Alpaca Green Room’. 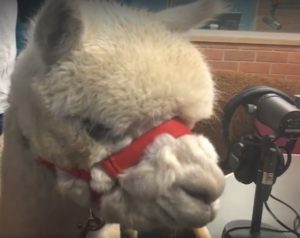 We chatted with Fiona (the ABC Central Victoria’s morning radio announcer) for about 20 minutes, answering various questions about alpacas and our business and allowing Wellington and Wyatt to check out the radio desk. Our earlier fears about having one (or both) of them misbehave, went completely unfounded. These beautiful boys were sensational, making for a fun time for everyone concerned. 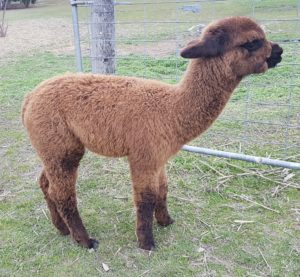 A sincere thank you to ABC Central Victoria Radio for taking such a positive interest our business, and the world of alpacas generally!